If you think this is a simple e-book, think again you fools! 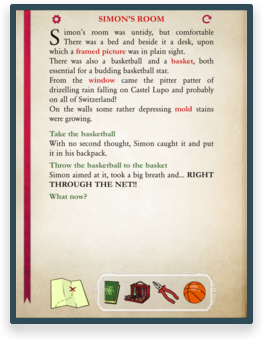 The Castel Lupo Secret is an interactive book where the characters’ destiny is in the readers’ hands. 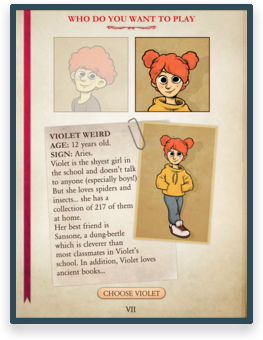 Simon and Violet Weird , two brave twins, have just found out they are descendants of a mad alchemist’s who lived in 1500. They also discover that they have inherited an old castle in the heart of the Alps. What bloodcurdling secret is hidden in the basement of this decayed mansion? Follow the main characters through rooms inside Castel Lupo; make your own choices about how to progress the adventure; use the objects you find to help solve the riddles; interact with the other characters until you can solve the final mystery. This will be an unforgettable holiday for twins Simon and Violet as they try to outwit or outrun nasty knights, plasticine monsters, hundred year old mummies and devilish gardeners. The main educational purpose of this collection of interactive books is to get young children interested in reading through play. 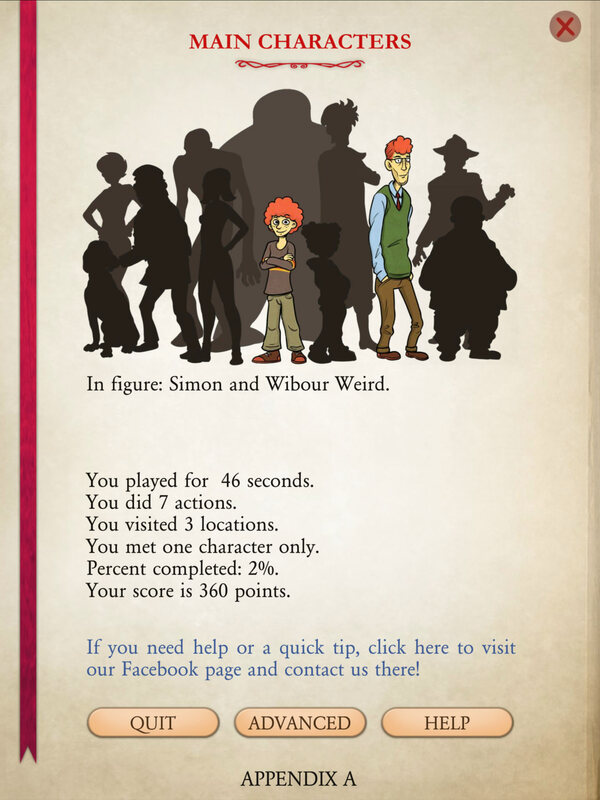 Our apps combine old traditional children’s stories with elements of modern video games. 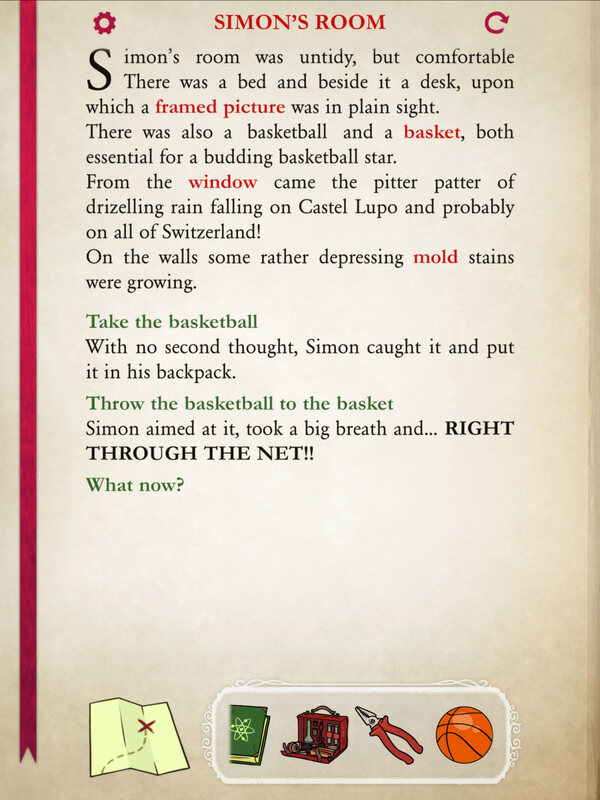 The Secret of Castel Lupo helps develop the readers’/players’ powers of reasoning and thinking. 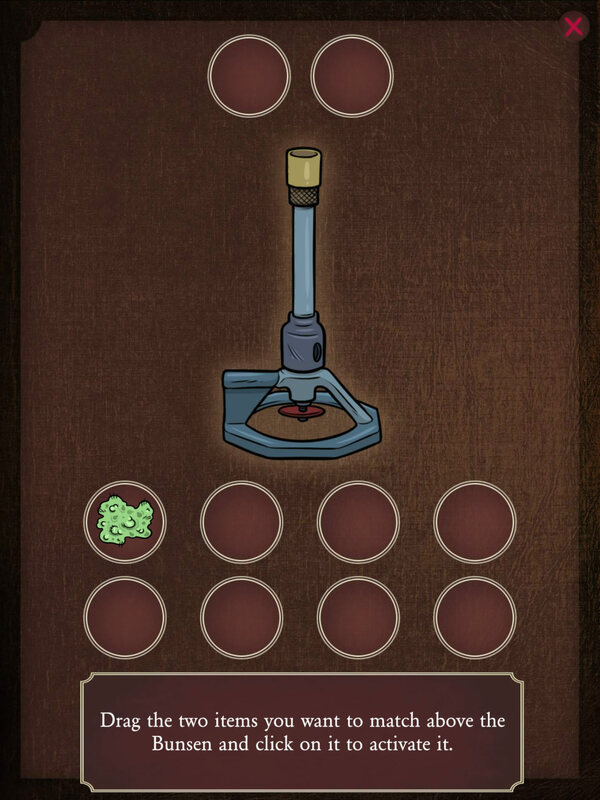 These skills are necessary to solve the interactive riddles to get to the end of the story/game. 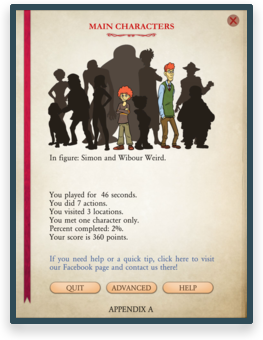 Although our app is targeted at very young users (8+), we are confident that adults will also enjoy it. Adults, don’t panic if you can’t complete a puzzle. We believe your children will be more than willing (and able) to help you find the best strategy to help you progress the story! If any journalist wants to write about us and our work download the press kit by clicking here. Finally, if you've any questions, you can contact us easily on our Facebook page! AMAZING INTERACTIVE BOOK ABOUT A BREATH TAKING ADVENTURE! BRAVE TWINS FEATURE IN THIS THRILLING AND FUN STORY! WIERD AND WONDERFUL CHARACTERS TO INTERACT WITH IN THE COURSE OF THE STORY! 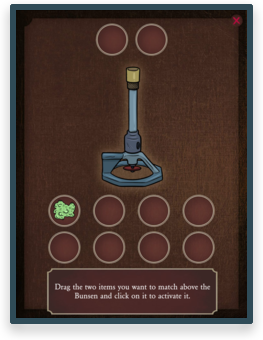 ROOMS FULL OF CRAZY PUZZLES AND LETHAL TRAPS! 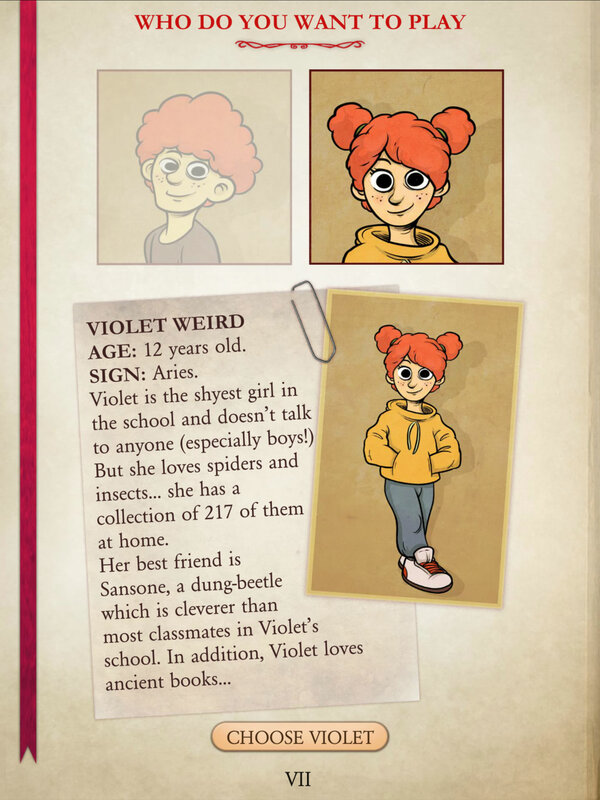 IMAGES TAKEN DIRECTLY FROM OUR INTERACTIVE BOOK! Il sito web castellupo.com utilizza cookie e tecnologie simili per garantire il corretto funzionamento delle procedure e migliorare l'esperienza di uso delle applicazioni online. Il presente documento fornisce informazioni dettagliate sull'uso dei cookie e di tecnologie similari, su come sono utilizzati da castellupo.com e su come gestirli. Cookie strettamente necessari. Si tratta di cookie indispensabili per il corretto funzionamento del sito castellupo.com e sono utilizzati per gestire il login e l'accesso alle funzioni riservate del sito. La durata dei cookie è strettamente limitata alla sessione di lavoro (chiuso il browser vengono cancellati). Cookie di profilazione. Si tratta di cookie permanenti utilizzati per identificare (in modo anonimo e non) le preferenze dell'utente e migliorare la sua esperienza di navigazione. Il sito castellupo.com non utilizza cookie di questo tipo. Il sito castellupo.com include anche talune componenti trasmesse da Google Analytics, un servizio di analisi del traffico web fornito da Google, Inc. (“Google”). Anche in questo caso si tratta di cookie di terze parti raccolti e gestiti in modo anonimo per monitorare e migliorare le prestazioni del sito ospite (performance cookie). Google Analytics utilizza i "cookie" per raccogliere e analizzare in forma anonima le informazioni sui comportamenti di utilizzo del sito web castellupo.com (compreso l'indirizzo IP dell'utente). Tali informazioni vengono raccolte da Google Analytics, che le elabora allo scopo di redigere report per gli operatori di castellupo.com riguardanti le attività sui siti web stessi. Questo sito non utilizza (e non consente a terzi di utilizzare) lo strumento di analisi di Google per monitorare o per raccogliere informazioni personali di identificazione. Google non associa l'indirizzo IP a nessun altro dato posseduto da Google né cerca di collegare un indirizzo IP con l'identità di un utente. Google può anche comunicare queste informazioni a terzi ove ciò sia imposto dalla legge o laddove tali terzi trattino le suddette informazioni per conto di Google. castellupo.com, non fa uso di cookie persistenti. Tuttavia, navigando sulle pagine si può interagire con siti gestiti da terze parti che possono creare o modificare cookie permanenti e di profilazione. Scottish born author, Wally Wonderfall came into this world in 1965 according to some, 1962 according to others. A graduate of Oxford College, no photos of him exist that don't feature a crude mask on his face. Unusually for an author, he claims he has no great love of books, as they don't allow the reader to have any say in how the story plays out. The title of his degree thesis was: Why did Romeo and Juliet have to die? Everything changed for Wally when he discovered the first video games. These were stories he liked... he could decide how they are going to end! Wally's former career highpoints included being an international Chess Grandmaster and author of crossword puzzles for low circulation estoteric journals. He has spent an active retirement living in a remote village on the shores of Loch Ness contemplating the development of new ways to challenge his younger readers: helping create interactive books like The Secret of Castel Lupo. Wally sold the exclusive rights of this volume to the Fix-a-Bug boys in exchange for fifty-two pounds of high quality gourmet spaghetti. By chance five ex teenagers with a lot of common passions meet in Turin on a summer evening in 2015: They chat about Lone Wolf books, old Amiga games, Lucasart's graphic adventures, Japanese cartoons... nothing too unusual about that, just a chat among nerds. Except that on this particular night the former teenagers in question discover one other thing... they have complementary skillsets that would enable them to resurrect a long held dream each of them had. Between them they could design, conceive and program video games. Their dream was alive. Fix-A-Bug was born that night. The Secret of Castel Lupo, is an interactive e-book aimed at a readership target of eight years, it is their first independent production. At the moment in addition to the sequel to the first volume, the Fix-a-Bug guys are devising two other video games projects. Luca Blengino: born in 1978. Since 2001 he has written comic books. In 2009 he branched out into authoring novels for boys. Alessandro Blengino: born in 1980; Since 2007 he has worked in the field of advertising; From 2010 he has illustrated books for kids, comics, snowboards and lots of other beautiful things. Flavio Trione: born on the first day of Spring 1977. Competes in Unreal Tournament as jacklafrutta. Programming is his passion. He always wanted to start a company with friends. Paolo Manca: born in Sardinia in 1967, transplanted to Turin a few years ago, lured by the magic of a Commodore 64 (which he still owns). A Web Programmer since shortly after Tim Berners Lee invented the web. Paolo Nicoletti: Class of 1972. An avid cartoon watcher since 1978. From 1980 onwards he combined watching cartoons with playing video games. Since 1986 he is a triple threat; watching cartoons, playing video games and programming. Our work was translated to English by Elena Martra and William "Faolain" Whelan.